This is a little client-side mod that makes sound more interesting. Right now it adds reverb to caves and mutes sounds when you're underwater and when the sound source is behind a wall. I probably won't check this page here very often, so if you want to give a comment or report a bug, it's better if you do so on the minecraft forum page. I love this mod, but it doesn't mute through walls enough and there's no config for it. I want it to almost completely mute sounds behind walls. 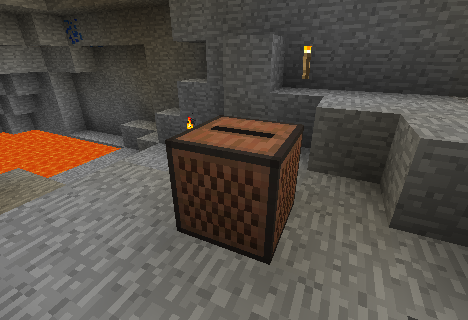 I love this mod, but could you please add a way to set a whitelist or blacklist of blocks that produce reverb? For instance, I only want reverb while I’m in caves, so if I could set a blacklist including the blocks that I use as the floors in my base (since I get reverb while I’m at home, which makes no sense), or if I could set a whitelist that includes stone and ores so that I only get reverb in caves, that would be incredibly useful. Even better, if you could include an option that makes it so that reverb only appears when you have a certain type of block above you—so, for instance, there could only be reverb when there are stone blocks or ores anywhere above me. Also, could you please disable reverb for the click sound (when you click on buttons in menus)? That doesn’t make much sense. I bet it would be possible to exclude this sound (minecraft:ui.button.click) from getting reverb. How can I add custom blocks to the reverbs config lines? [00:10:49] [Client thread/INFO]: [com.tmtravlr.soundfilters.SoundFiltersMod:preInit:203]: [Sound Filters] Error while loading in custom reverb entry! Not sure if it's because of the custom blocks or empty lines and comments. //e: Alrighty, I can't have comments or empty lines between lines. Thank you for your mod! Do you think your mod is compatible with https://minecraft.curseforge.com/projects/ambientsounds please ? Can I add this awesome mod in a modpack, please? Could you add configuration for inventory UI clicks having reverb? Sadly, removing the reverb from just the UI clicks would be very hard. Could you please update this to new forge 1.13.2? Surprised this isn't in vanilla yet! This should be in Vanilla Minecraft! Awesome mod, but I have one small suggestion: A master occlusion level. It'd be nice to turn down the effect slightly overall, instead of per-block. I really dig the effect that occlusion creates, but when you're breaking blocks from behind a 1 block high wall, the breaking sound gets occluded even though the blocks are in full view of the player. Or perhaps even a minimum block width to trigger occlusion. There is a problem with Dynamic surroundings when combined with this mod it hurts peoples ears and is Sue worthy. Please get them to make there sounds more ear Friendly. I love this mod and always use it, but I have a suggestion: add a sound isolator block that doesn't let sound pass through. The lasers from the Mekanism fusion reactor are very loud and I'd like to isolate it, but even with 2 layers of other blocks the sound still passes through like there's nothing there. Would be awesome to have a tier 1 block that would let 67% of the sound through, a tier 2 that would let 33% and a tier 3 that would let no sound through. Unfortunately, this mod is client side, so I doubt he'd add something like that. Have you tried using 3 layers of wool? Would you mind backporting that dynamic surroundings fix for 1.10?